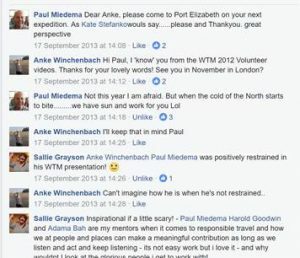 Paul and I met more than three years ago, when he left a short message on a people and places Facebook post about my volunteer placement in The Gambia. 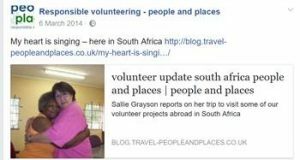 His comment turned out to be the beginning of an exciting chapter of the lives Paul and I shared for a while as colleagues, passionate advocates for responsible tourism and social justice, co-authors, and friends. It seems appropriate telling our story through the medium that brought us together, and adding some bits that sum up a man who truly inspired me and will have a special place in my heart forever. 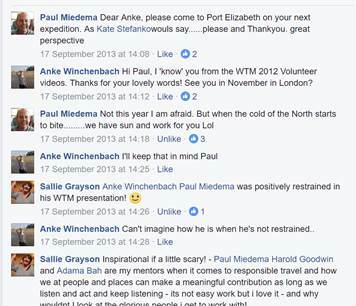 The video of Paul passionately speaking about responsible volunteering at WTM 2012 was the only thing I knew about Paul at that point. He addressed the issues in community volunteering in a way that left no doubt about what irresponsible volunteering looks like – ‘inspirational if a little bit scary’ as Sallie rightly said above. 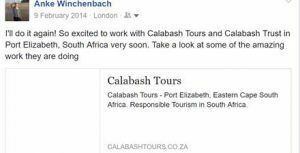 Paul’s messages, both, from his talk and comment on Facebook stayed in my mind and the idea of working with Calabash started brewing in my head for a couple of month. The process of writing, providing feedback to each other and rewriting was quite a lengthy one. For Paul, every single word had to be scrutinised for its meaning, and he was really hesitant to adapt to a more academic writing style – typical Paul, he felt it had to be said the way it was. 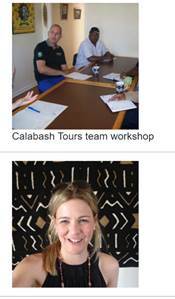 We had planned to write and publish more like this together for others to learn and be inspired by Calabash’s approach to responsible township tourism. 2015 until recent – delighted seeing Paul’s articles being published on Germany’s tourism-watch.de website, seeing him becoming a spokesperson for child protection, continuing supporting township schools and other initiatives by linking skilled volunteers to projects, supporting PhD researchers, and still being passionate about sharing a bit of his world with visitors during Calabash’s responsible township tours. February 2017- this story of Paul and I ends here. Beyond the memory snippets above, he was great fun to be around, at least most of the time. I never met somebody like him who could drive one up the wall with his passion for a good debate and stubbornness, while at the same time being very generous explaining things and trying to find solutions. I’m sad beyond words having lost such an inspirational mentor, colleague and friend – travel well Paul.